GRAHAM, ANDREW, HBC chief factor and naturalist; b. in Scotland, probably in the mid 1730s; d. 8 Sept. 1815 in Prestonpans, Scotland. Andrew Graham joined the Hudson’s Bay Company as a youth in 1749 and went first to the most northerly of its trading stations, Prince of Wales’s Fort, also known as Churchill (Man.). Among the more interesting of his duties was service on three of the summer slooping expeditions which traded with the Inuit living in the northern parts of Hudson Bay. In 1753 he was appointed assistant writer at York Factory (Man. ), where under chief factor James Isham* he held positions of increasing responsibility. 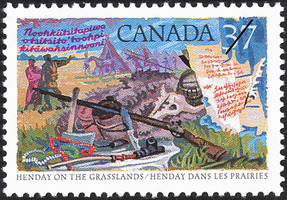 From 1761 to 1774 Graham was master at Fort Severn (Ont.) save for two seasons, 1765–66 and 1771–72, which he spent as acting chief at York, and a year’s leave in 1769–70. From March 1774 until August of the following year he was at Prince of Wales’s Fort once again, this time as chief factor. Graham retired from the company’s service in 1775 and lived in or near Edinburgh until his death. Since the opening of the HBC archives Graham has emerged both as a key figure in the company’s inland expansion of the late 18th century and as an important early naturalist. His main claim to recognition rests on the remarkable series of manuscript “Observations” he wrote from 1767 onwards. Begun perhaps as an elaboration and a continuation of the notes kept by Isham in the 1740s, they contain narratives of life at posts on the bay, detailed trade lists, meteorological and astronomical observations, transcripts of journals by company explorers, and the first known vocabularies of the Fall (Gros Ventre) and Sarcee Indians. In actual fact, these short vocabularies, together with much else of Graham’s rather sketchy information about the interior Indians, were obtained from other company men, for Graham himself never travelled inland. On the other hand, his much fuller sections on the Crees derived from his own experience at York and Severn, and they are among the most detailed accounts we possess of the bayside Indians. Even more interesting to anthropologists are Graham’s comments on the Inuit he had seen along the west coast of Hudson Bay, for written material on their culture in this early period of European contact is otherwise almost non-existent. Above all, Graham’s manuscripts contain long sections on the natural history of the bay region, the fullest on birds. Together with his written observations, Graham from 1770 onwards made extensive collections of natural history specimens (again, birds predominated) and sent them to London. The first shipments of Graham’s specimens, together with some of his notes, were described by naturalist Johann Reinhold Forster in three papers published in the Royal Society’s Philosophical Transactions in 1772 and 1773. Graham had no scientific training and made elementary mistakes in his classifications; nevertheless, his invaluable firsthand observations and the specimens he continued to send home formed the basis for much of the second volume of Thomas Pennant’s celebrated Arctic zoology (2v., London, 1784–85) and his Supplement (London, 1787), as well as of the North American material in the third volume of John Latham’s A general synopsis of birds (3v. in 6, London, 1781–85). But after the appearance of Forster’s articles, acknowledgments to Graham by the world of learning had almost ceased. His material was circulated among naturalists in England by his old colleague and fellow collector in the bay, surgeon and naturalist Thomas Hutchins*, who was corresponding secretary of the HBC in London from 1783 until his death in 1790; and Hutchins seems to have appropriated the credit for observations that were wholly or mainly Graham’s. Graham suffered more plagiarism as well: several of the more reliable sections of Edward Umfreville*’s The present state of Hudson’s Bay . . . (London, 1790) were taken straight from Graham’s manuscript journals. In addition to their importance to natural science, the “Observations” provide an unrivalled picture of the company’s trading methods in the mid 18th century. Here Graham was more than a mere collector of information, important though his remarks are for the insight they give about private trade and other matters on which the official records are usually reticent. His two seasons as acting chief at York coincided with an increase in pressure on the HBC’s trade by rival pedlars from Canada. To counter this threat Graham in 1766 sent six men on separate inland expeditions to investigate and block Canadian penetration along the river routes leading down to the bay; but by the time he returned to York five years later it was clear this strategy had failed. In 1772 on the advice of John Cole*, a deserter from the Canadians, not only did he order Matthew Cocking* inland on the most ambitious journey by a company servant since Anthony Henday*’s explorations, but in August he also sent a crucial memorandum together with a map to the London committee arguing that a permanent inland post should be established at Basquia (The Pas, Man. ), possibly with Samuel Hearne* in command. It was this plan that the committee, long since worried about the company’s deteriorating position in the bay, accepted the next year; and in 1774 Hearne, after discussing the project with Graham at Churchill, left for the Saskatchewan River to set up a post. 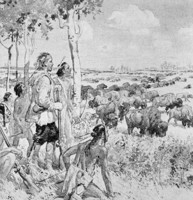 This action marked a radical departure from the company’s traditional practice of drawing the Indians down to the bay to trade. Graham’s family life was a complicated one. He had married Patricia Sherer in Edinburgh on 6 May 1770; he had at least two mixed-blood children in Hudson Bay, both of whom seem to have joined him in Scotland after his retirement; and at some stage he married Barbara Bowie. 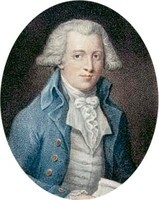 During his retirement Graham kept in touch with the London committee and with former colleagues in Hudson Bay, who even long after he formally retired sent him information concerning, for example, the raids on Prince of Wales’s Fort and York conducted by the French under Jean-François de Galaup*, Comte de Lapérouse, in 1782. He continued revising and recopying his “Observations” until the last known version of 1791; and the next year he sent his remaining journals, together with some maps, to the company in London. Despite an appeal in 1801 for financial help, which the London committee answered with the award of an annual gratuity, Graham died, as his will indicates, a man of some substance – though one whose contribution to Europe’s knowledge of the Canadian north seems to have been totally forgotten long before his death. Glyndwr Williams, “GRAHAM, ANDREW,” in Dictionary of Canadian Biography, vol. 5, University of Toronto/Université Laval, 2003–, accessed April 26, 2019, http://www.biographi.ca/en/bio/graham_andrew_5E.html.